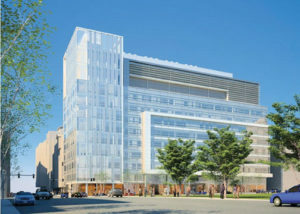 Dana-Farber Cancer Institute, Longwood Center, Boston, MA - J. & M. Brown Company, Inc. Scope: Electrical installations for four floors of cutting-edge laboratory research space and administrative offices for world-leading cancer research organization. Installations include primary and emergency power systems, fire alarm, lighting and lighting control systems. Unique Project Challenge: Logistical planning and management of 60-person crew and electrical equipment deliveries at 11-story facility on tight site with numerous trades. Concurrently provided base building shell and core installations as well as tenant fit-out of highly sophisticated laboratory space. This entry was posted in Life Sciences, Tenant on May 19, 2014 by artefact_admin.